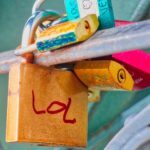 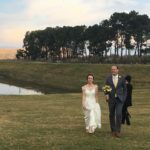 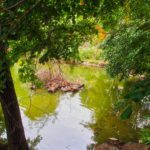 This September, Ingrid and Ian of Oxford Law fame got married at a cherry orchard outside of Johannesburg, South Africa. 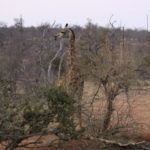 I scheduled vacation for the grand event and was able to fly over a few days early to see some animals in Greater Kruger National Park. 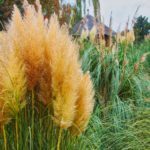 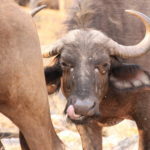 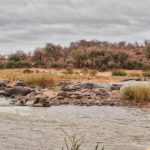 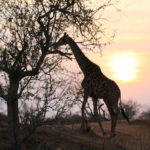 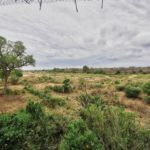 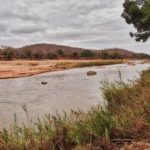 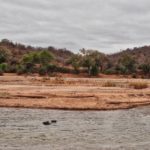 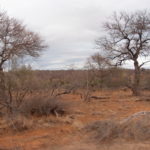 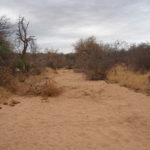 After a long journey including three flights and a day-long layover in Frnakfurt, I arrived Monday at the Ku Sungula lodge in the Balule Nature Reserve, near the town of Hoedspruit. 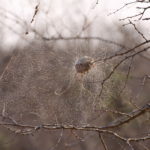 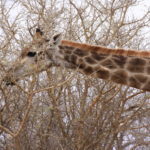 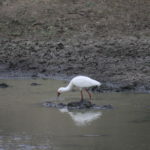 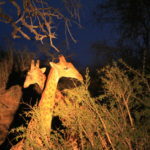 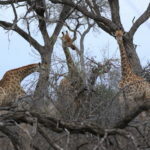 I set out on daily morning and evening safari drives before meeting up with Sonya and Andrew on Thursday and enjoying some further exploration and the wedding festivities with them. 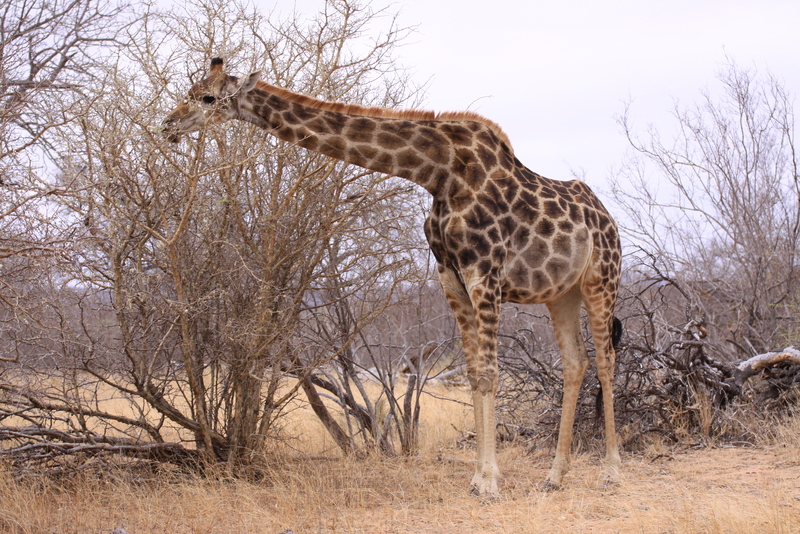 The variety and quantity of animals were astounding! 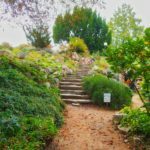 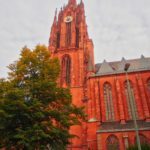 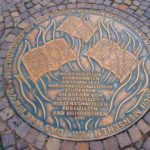 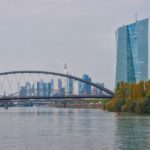 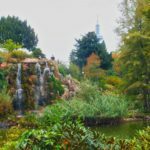 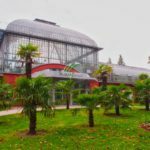 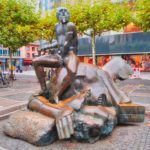 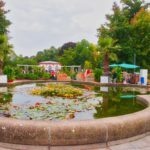 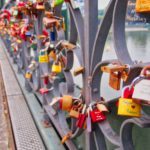 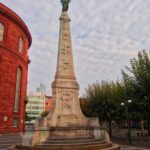 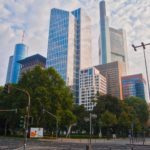 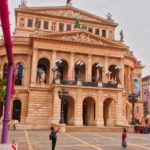 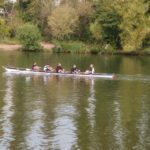 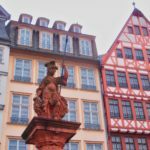 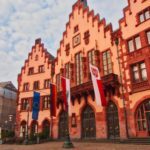 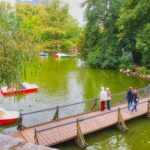 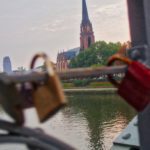 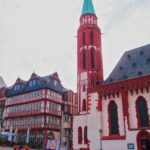 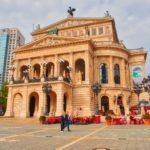 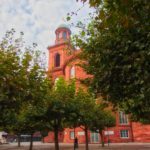 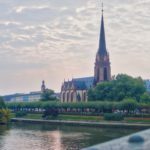 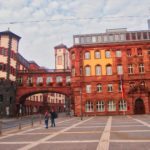 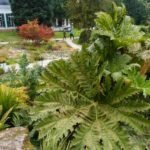 Although I only had a few hours to explore Frankfurt, I enjoyed wandering around the city and seeing the Römer city hall and Cathedral of St Bartholomew, taking a tour along the Main river, visiting a plaque mourning the book burnings, and exploring the Palmengarten botanic garden. 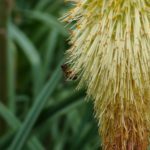 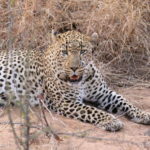 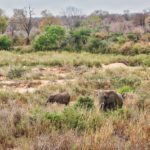 After the flight to Nelspruit and drive to the Ku Sungula lodge on Monday, there was a bit of time to settle in before the twice-daily safari drives commenced. 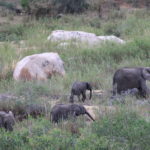 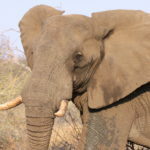 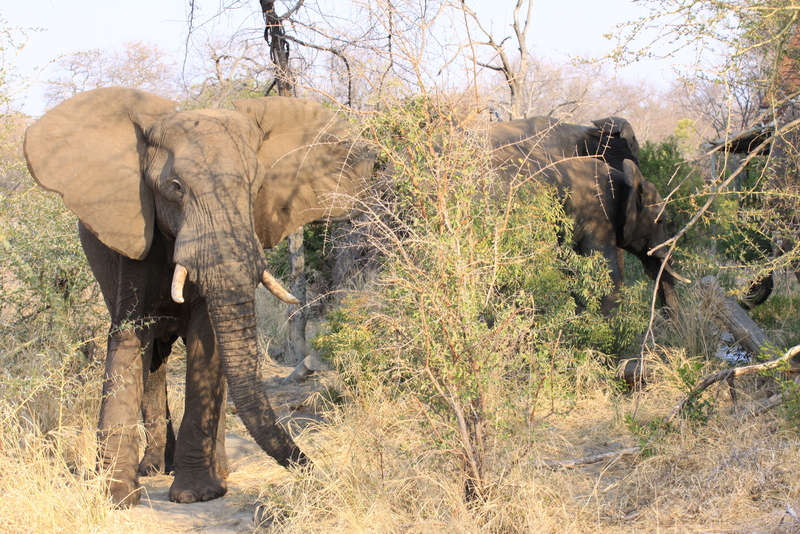 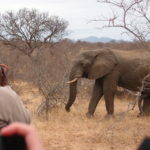 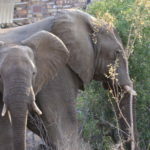 The first drive began with an impressive herd of elephants right outside of the lodge. 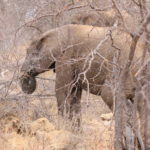 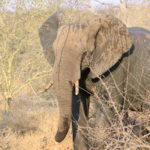 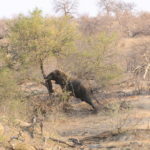 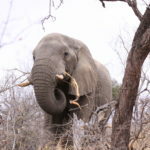 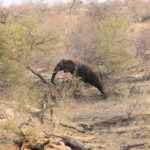 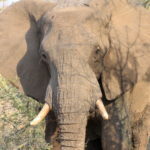 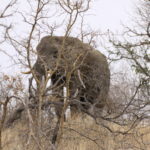 The elephants were out in force, perhaps celebrating their own Heritage Day, and we saw one push over a tree to eat its roots. 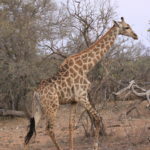 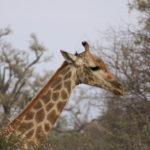 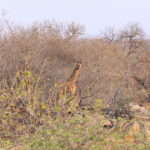 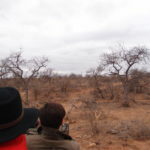 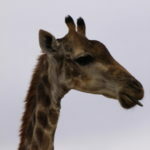 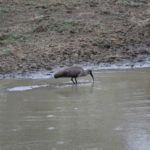 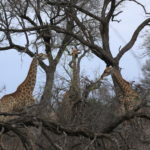 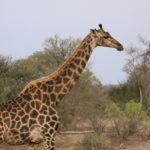 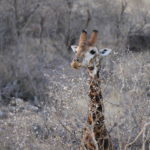 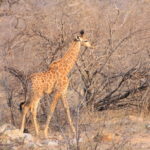 Continuing on the drive, we saw plenty of giraffe, a warthog, lots of impala, and a waterbuck. 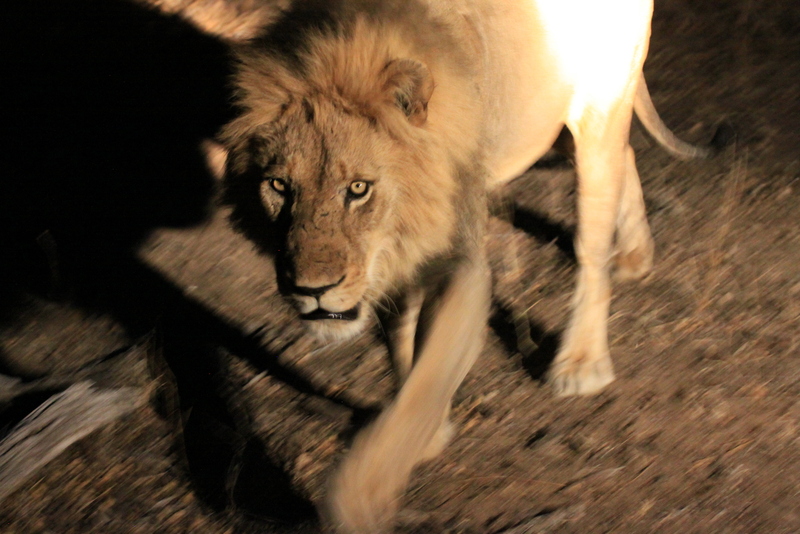 After a much-needed night of sleep, we set off for the second drive at 6 a.m. the next morning. 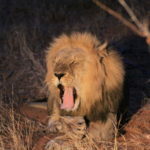 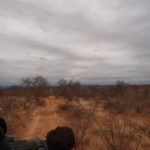 (It was comforting to learn that anesthesia hours had prepared me for safari hours!) 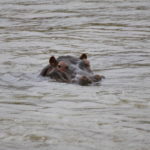 Our guide, Leanne, was really on her game this morning. 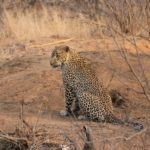 After seeing a large group (a “towering“) of giraffes at the outset, we managed to find a leopard whose tracks we noticed the previous night. 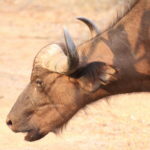 It was lying in wait outside of a termite mound that an unsuspecting warthog had burrowed into to gorge on termites. 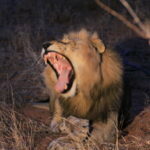 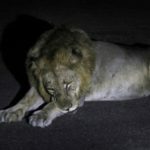 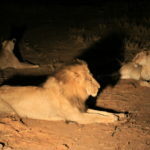 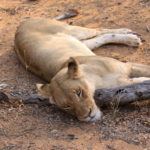 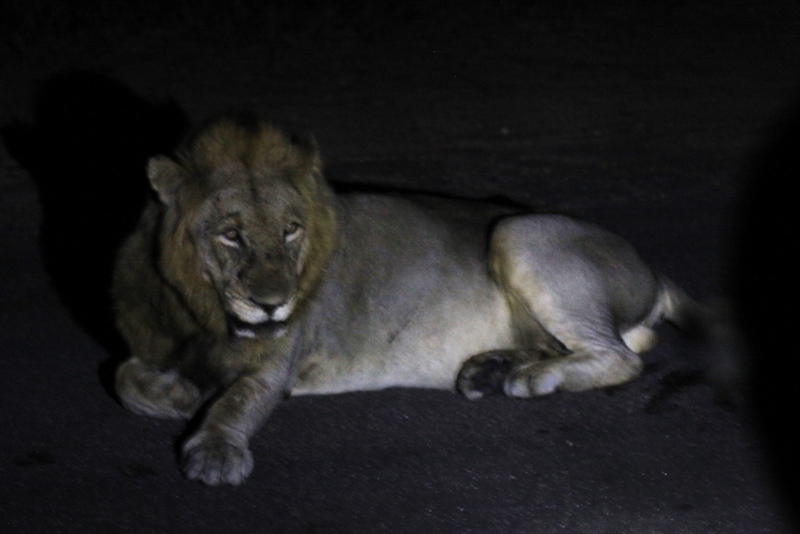 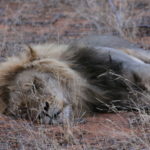 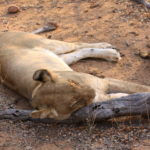 Leaving the leopard for a bit, we came across a pride of lions napping after a night of hunting. 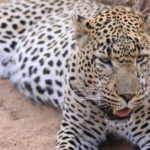 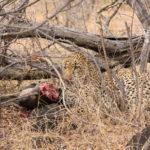 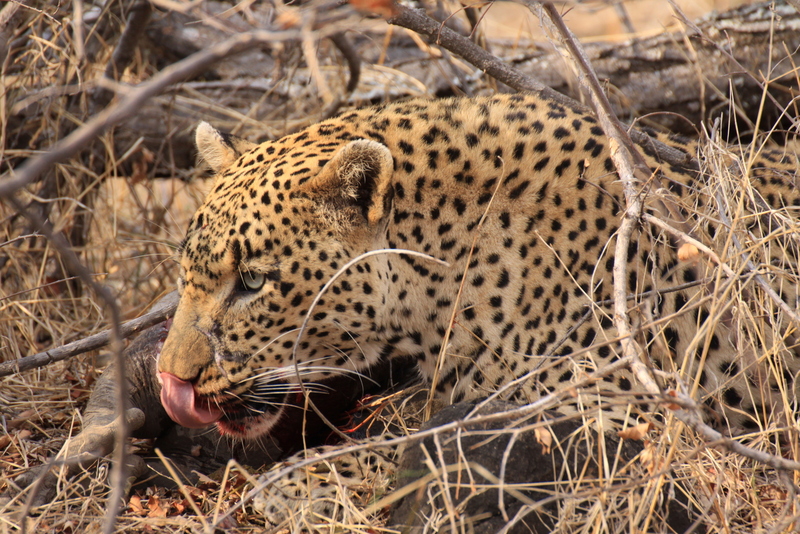 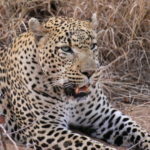 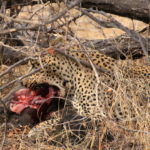 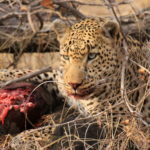 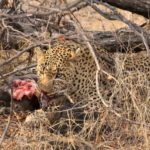 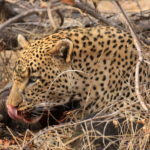 After spending a bit of time with the lions, we went back to the leopard, whose patience had paid off: he was munching on a fresh warthog lunch. 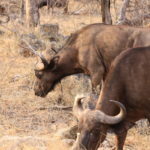 On the way back to the lodge, we came across a large group (an “obstancy“) of Cape buffalo. 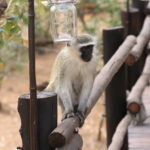 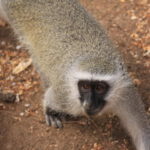 Upon returning to the lodge, I discovered some vervet monkeys making mischief! 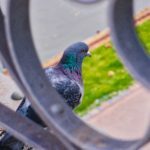 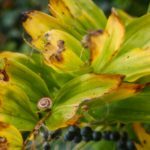 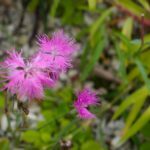 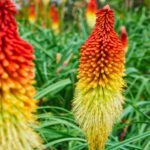 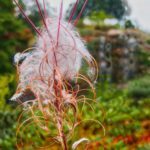 Apparently looking to outdo her morning performance, Leanne took us on an evening drive that revisited those old favorites and discovered some new ones. 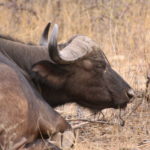 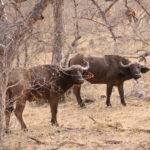 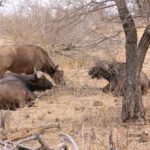 First, we stopped to see the Cape buffalo that we’d been introduced to earlier in the day. 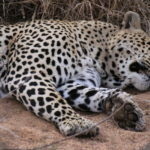 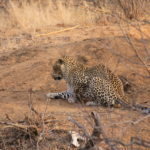 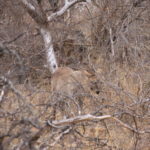 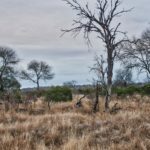 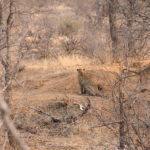 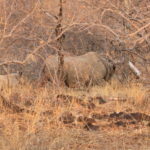 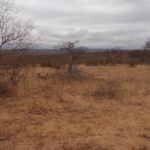 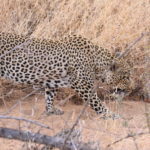 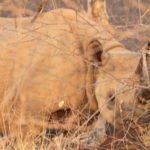 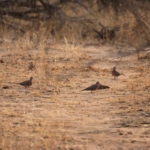 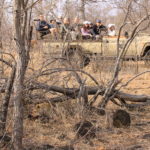 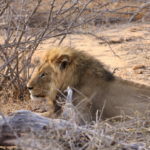 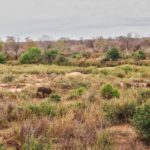 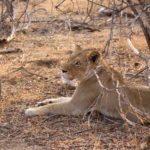 Driving off from there, we stumbled upon a black rhinoceros mother and cub, completing the so-called “Big Five.” We then revisited our leopard and lion family from the morning, all of whom were just waking up from their long naps. 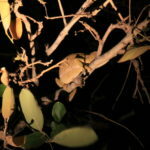 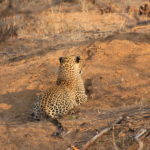 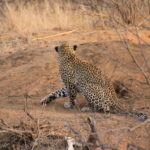 After following the lions to their watering hole, we drove back to the lodge, spotting a chameleon along the way. 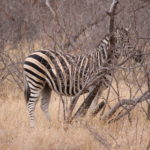 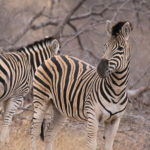 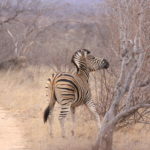 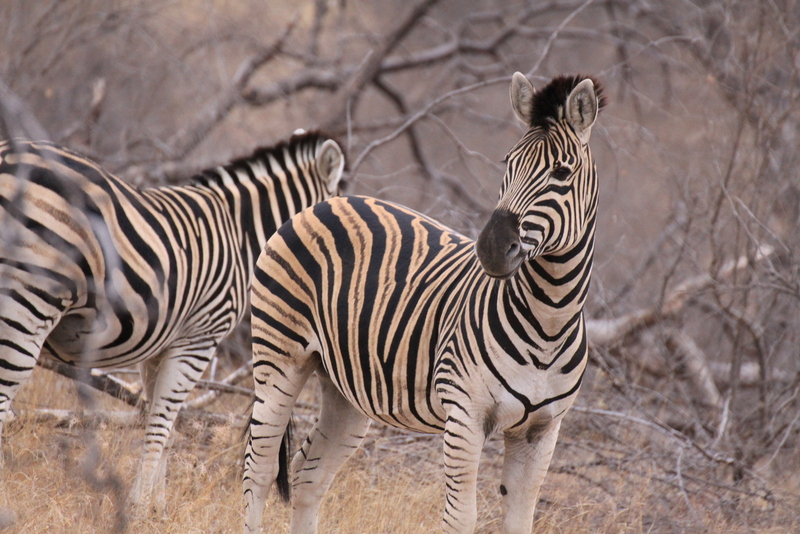 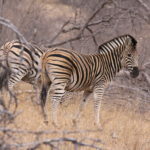 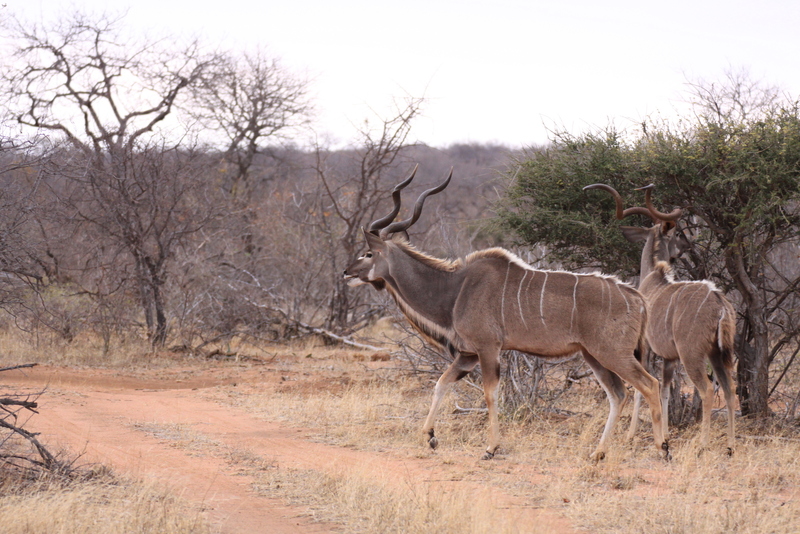 After a windy night, the morning game drive was a bit quiet to begin with, primarily featuring antelope and zebra. 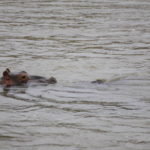 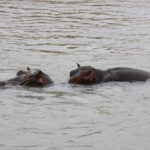 We went to see whether there were any animals bedded down by a nearby river, and were surprised to see a family of hippopotami taking a bath, with one baby standing on its parent’s back! 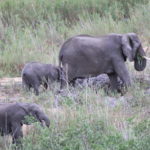 On the way back, we came across a breeding herd of elephants, with quite a few mothers and juveniles snacking on some trees. 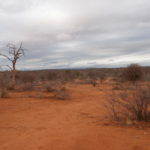 I also tried to take a few pictures of the landscape on this drive to give a better sense of the safari backdrop. 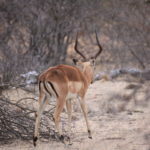 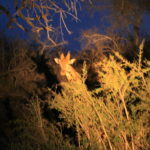 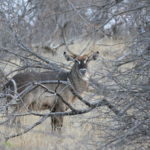 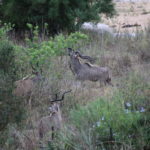 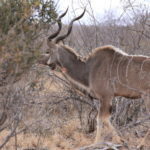 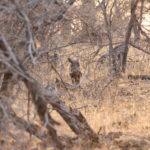 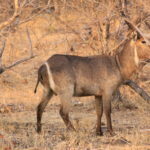 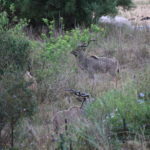 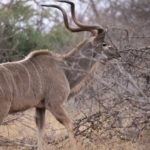 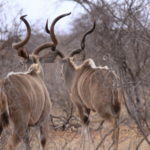 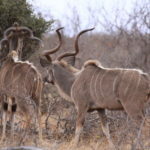 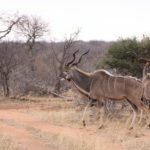 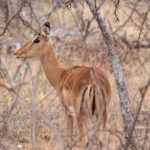 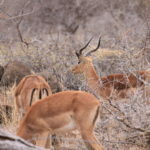 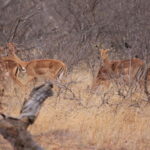 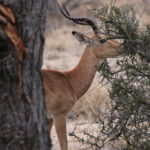 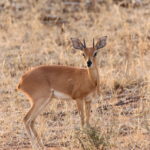 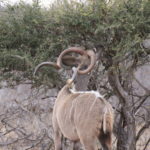 The evening safari drive also began as an antelope day with some impala and a couple of impressive kudu bucks. 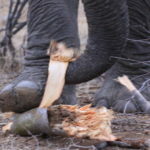 We then came across a couple of elephants picking apart the remnants of a tree. 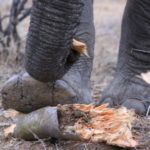 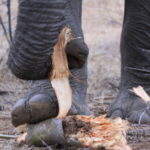 It was fascinating watching them use their feet, trunks, and teeth to demolish the wood into bite-sized pieces. 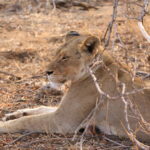 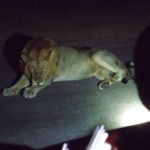 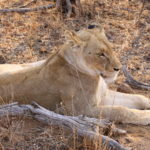 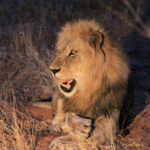 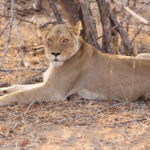 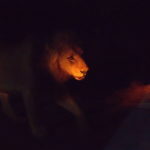 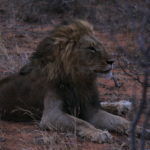 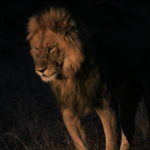 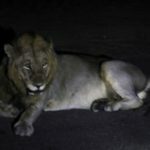 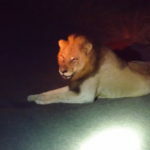 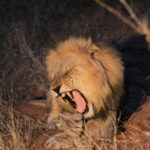 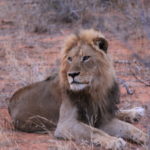 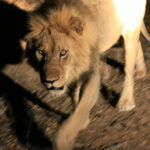 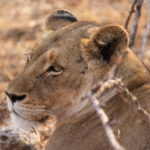 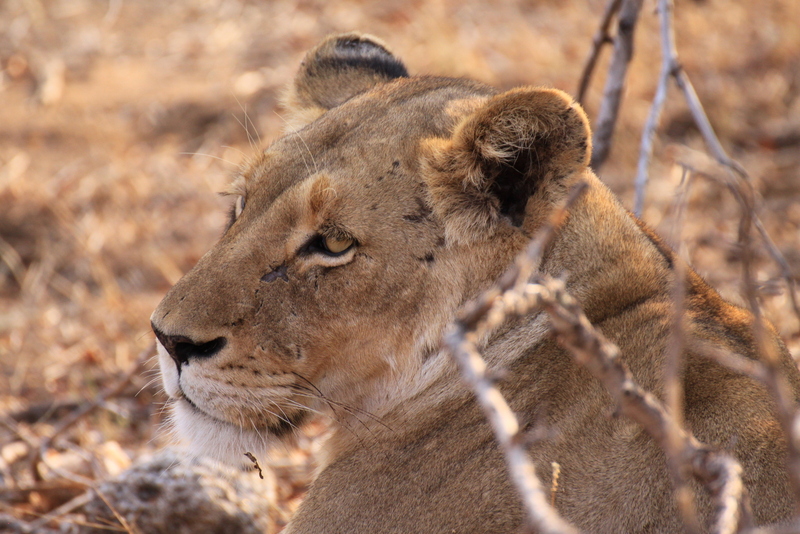 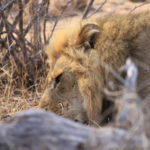 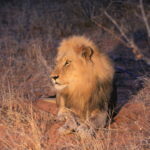 Finally, we tracked down a lone female lion that was out and about, looking for either her pride or some tasty treats. 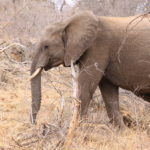 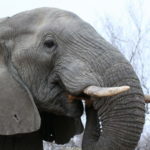 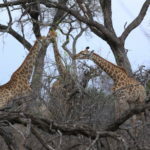 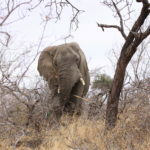 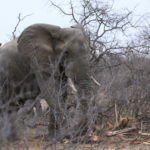 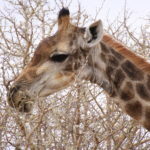 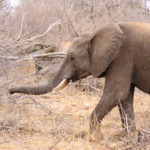 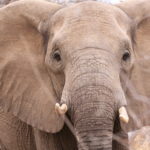 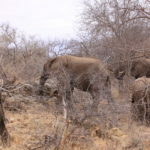 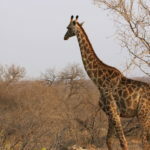 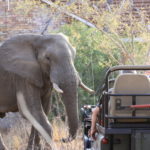 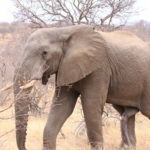 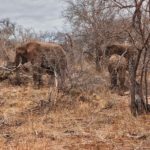 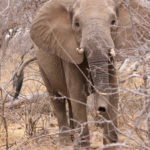 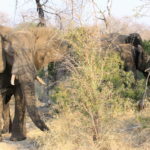 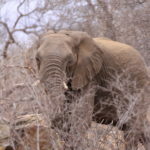 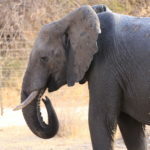 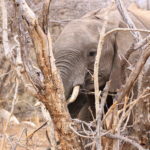 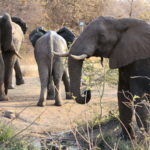 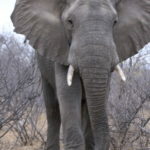 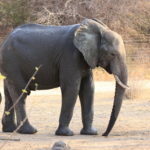 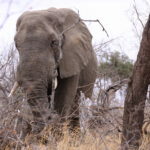 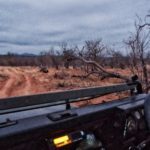 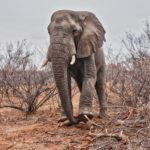 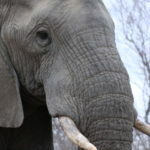 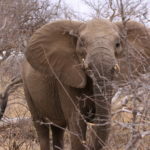 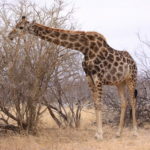 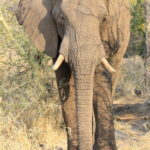 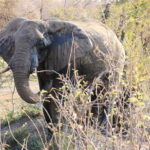 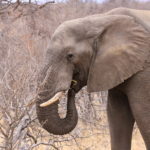 My final game drive with the Ku Sungula crew and our tracker Leanne got off to a bit of a slow start, but by the end of the day we found some giraffe and were able to track down our favorite breeding herd of elephants again. 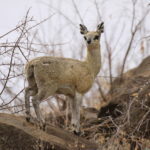 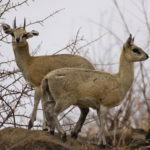 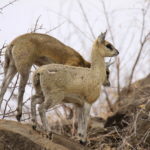 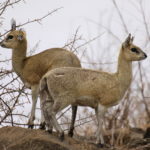 We also came across a pair of klipspringer (Afrikaans for “rock leaper”), a small, agile antelope that hops around on the tops of rock mounds, normally in a quite close pairing. 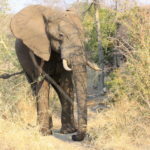 After Thursday’s morning game drive, I set off to meet Sonya and Andrew at their hotel near the Paul Kruger gate of Kruger National Park. 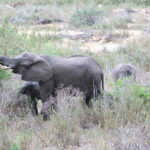 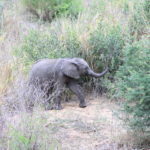 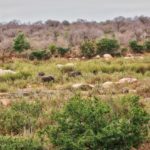 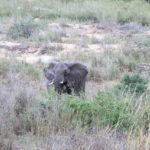 From the overlook areas of the hotel, we could see into the park where elephants — including a young juvenile — and kudu were browsing and grazing. 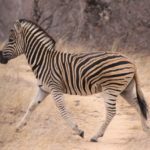 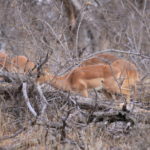 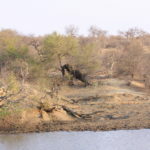 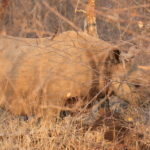 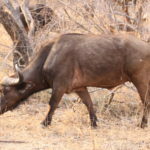 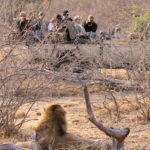 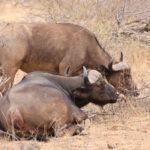 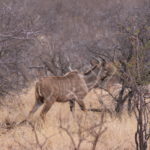 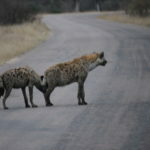 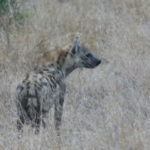 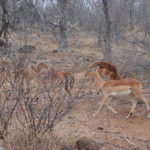 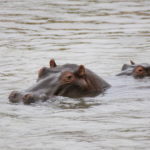 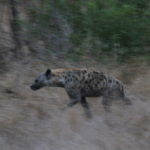 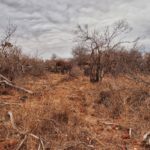 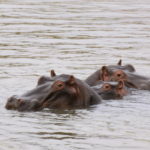 After catching up over lunch, we went on a guided tour through Kruger proper, where we saw giraffe, hyena, wild dog (a rare find, unbeknownst to us at the time), hippopotamus, and of course the ever-present impala before coming across a lion on the tar road. 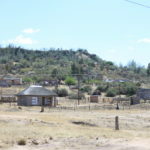 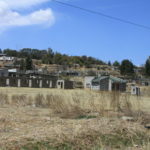 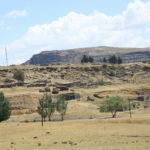 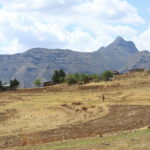 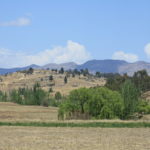 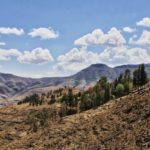 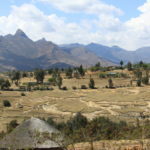 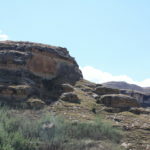 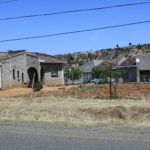 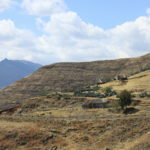 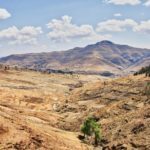 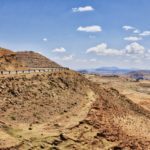 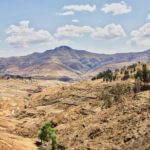 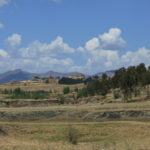 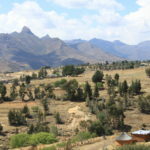 On the morning before the wedding, Sonya, Andrew, and I drove through Lesotho, an enclave country reliant primarily on subsistence farming with an early mining and manufacturing industry. 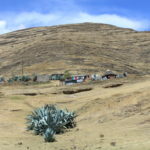 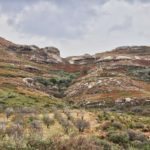 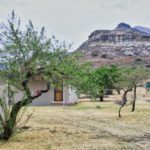 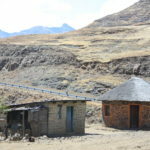 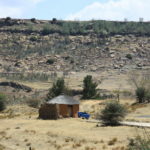 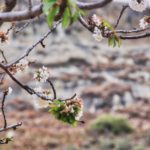 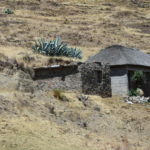 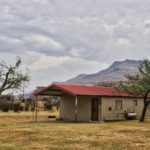 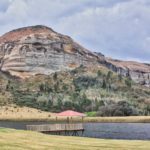 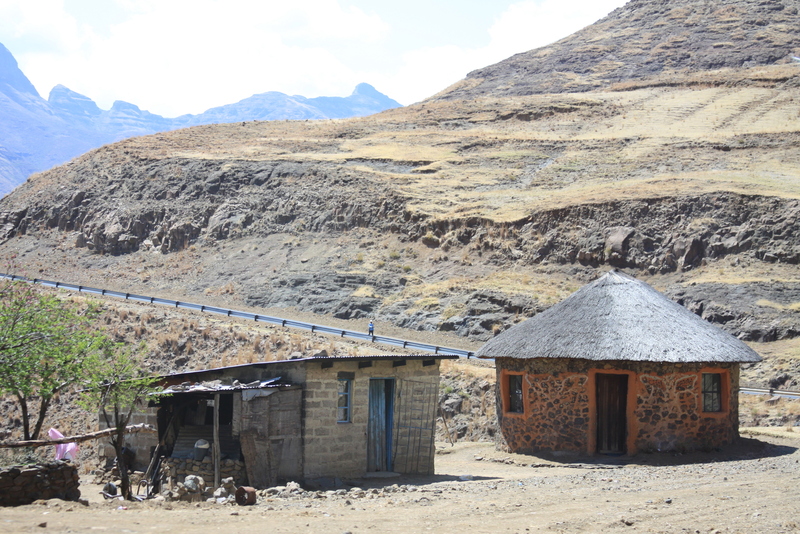 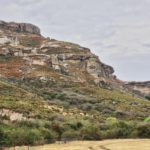 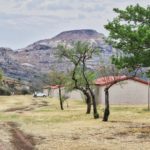 We saw some beautiful mountain scenery as well as traditional rondavel huts interspersed with cinderblock and corrugated metal construction. 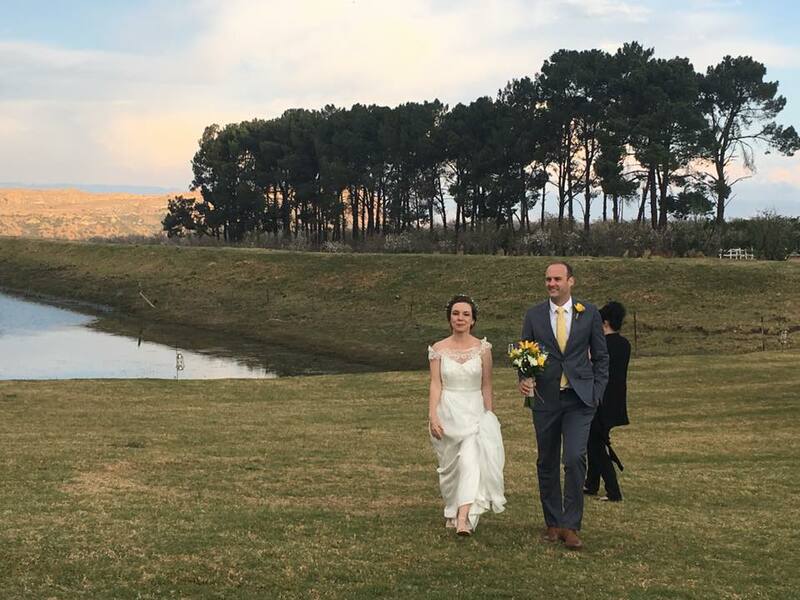 The wedding itself was beautiful, set in a cherry and apple farm in the Witteberg mountains. 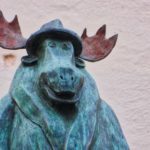 It was amazing to be reunited with a few beloved Oxonians after so many years, to meet many new friends, and of course to see Ingrid and Ian begin the rest of their life together.